Set in a rural Texas town, this ABC sitcom from the 1974-1975 season followed the (mis)adventures four motherless children whose drunk, lazy father unexpectedly returns. The network cancelled it after airing just four episodes but later broadcast four others during the summer repeat season. Heading into the 1974-1975 television season, independent production company MTM Enterprises had six sitcoms on network television, two returning shows and four new ones. The returning shows were critical and popular hits: The Mary Tyler Moore Show, which ranked ninth during the 1973-1974 season, and The Bob Newhart Show, which ranked 21th. Both aired on CBS. Two of the new shows would also air on CBS: Rhoda (a spin-off of The Mary Tyler Moore Show) and Paul Sand in Friends and Lovers, which had been giving the coveted post-All in the Family time slot on Saturday evenings. The other new shows were The Texas Wheelers, which would air on ABC, and Second Start, which would air on NBC. They would be the first MTM shows not to air on CBS. With its total of six shows, MTM had overtaken Norman Lear’s Tandem Productions which had just four sitcoms scheduled for 1974-1975: All in the Family, Good Times, Maude (all on CBS), and Sanford and Son (NBC). The Texas Wheelers was created by Dale McRaven, who also served as executive producer. An early title for the series was The Hogg Family . It had been renamed by the time ABC released its fall schedule for the 1974-1975 season on April 24th . The series was given the 9:30-10PM time slot on Fridays after The Six Million Dollar Man and before Kolchak: The Night Stalker. It would compete with The CBS Friday Night Movie and fellow MTM production Second Start on NBC. Set in the fictional rural Texas town of Lamont, the half-hour sitcom starred Jack Elam as Zack Wheeler, a crusty, lazy, hard-drinking man. When their mother died, Zack abandoned his children to look for gold in the mountains or, more likely, spend his time and money drinking. Thus, the Wheeler children were left basically orphaned, and set about learning how to live on their own. The oldest, 24-year-old high school dropout Truckie (played by Gary Busey), took over as head of the household, supporting his younger siblings by working odd jobs. The other three were all still in school: 16-year-old Doobie (played by Mark Hamill), who looked up to Truckie and often turned to him for advice; 12-year-old Boo (played by Karen Oberdiear), the only girl in the family who tried her best to bring a female perspective to the family; and 10-year-old T.J. (played by Tony Becker), the somewhat sly but curious youngest member of the Wheeler clan. After an eight month absence, Zack unexpectedly returned. Truckie and Doobie were old enough to generally dislike their father; Boo and T.J. young enough to love him despite his many faults. Zack immediately set about inserting himself into the lives of his children, whether they wanted him involved or not. Zack spent much of his time avoiding work and trying to impart his wisdom on the children. “He’s a nice guy, but he’s a jerk,” explained Elam. “He’s a lazy loudmouth with a good heart” . In June, only a few months before the start of the 1974-1975 season, ABC and the other networks were forced to rework their schedules after an appeals court ruled that the FCC’s planned revision to its Prime Time Access Rule couldn’t be implemented until September 1975 . All three networks shifted programs around and dropped plans for some new sitcoms. One casualty was Second Start, which was pushed to mid-season. That cut MTM’s series count to five for the 1974-1975 season. The Texas Wheelers would instead compete with The Rockford Files on NBC, a new drama starring James Garner. Many critics loved the series. Jay Sharbutt of the Associated Press was one of them. He called The Texas Wheelers “one of the funniest, best-written shows I’ve ever seen” and praised creator Dale McRaven’s “excellent sense of the off-hand, deadpan humor of the Lone Star state” . The Pittsburgh Post-Gazette‘s Win Fanning was also firmly in the love it column, who wrote in his review “the script, the cast, the direction and over all production values are beautifully blended into one of the most satisfying TV comedies ever” . John J. O’Connor of The New York Times also liked the series. He called it “the perfect antidote for the dull hangovers trailing much of what is called ‘warm family drama’,” contrasting the series with shows like The Waltons. He referred to the Wheeler clan as “delight originals” and the show “delightfully acted and sharply perceived” . And Gary Deeb of The Chicago Tribune was lavish with his praise for the series, which he called “a deliciously strange kind of TV series” that “alternates devilishly between sentimental schmaltz and sophisticated wit” . But there were some critics who weren’t as impressed. “Nobody strained the imagination in putting together this package of stereotyped people and situations,” said Morton Moss of The Los Angeles Herald-Examiner . Wade H. Mosby of The Milwaukee Journal also gave the series a negative review. “Everybody tries hard to make this thing float,” he wrote, “but the whole premise is so, well, moldy and raunchy that it keeps sinking before your very eyes” . Viewers either agreed with the negative reviews of the series or were simply too busy watching The CBS Friday Night Movie or The Rockford Files to bother sampling The Texas Wheelers. The series premiere on Friday, September 13th averaged an anemic 11.0 Nielsen rating and ranked 57th out of 59 programs for the week [11, 12]. For the first two weeks of the new season, the series averaged an 18.5% share of the audience, far behind the 33.5% for The CBS Friday Night Movie and the 38.0% for The Rockford Files . ABC’s entire Friday night line-up was in trouble, with all four shows drawing weak ratings, including the networks returning series The Six Million Dollar Man. The Texas Wheelers fared only slightly better than Kodiak, which led off the night at 8PM. ABC at first announced it would be pre-empting some or all of its Friday line-up throughout much of October to broadcast movies . In early October, however, it announced it was cancelling both Kodiak and The Texas Wheelers. 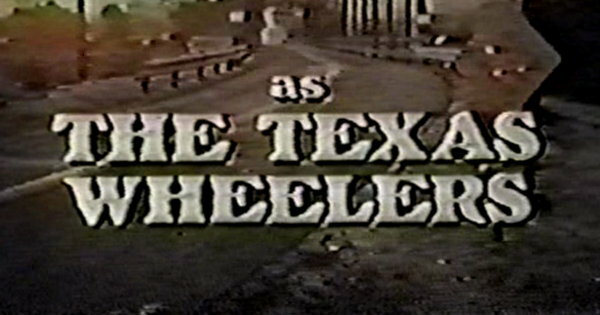 Due to a pre-emption on October 11th, just four episodes of The Texas Wheelers had aired before the series was canned. Kodiak was able to get five on the air. Broadcasting called the cancellations after so few episodes “a near-record vanishing act for shows premiering in the fall season” . A total of 13 episodes had been produced. The cancellation of The Texas Wheelers meant MTM Enterprises had only four shows on the air, the same number as Norman Lear. Paul Sand in Friends and Lovers was also soon cancelled, its last episode airing on January 4th, 1975. It was replaced by The Jeffersons, a spin-off of All in the Family created by Lear and produced by his T.A.T. Communications Company. MTM’s Second Start was retitled The Bob Crane Show and premiered on NBC in March 1975. It was the company’s third straight failure, off the air after 13 episodes. In June 1975, ABC brought back The Texas Wheelers for a brief summer run, replacing Karen (itself a mid-season replacement). The premiere episode was rebroadcast on Thursday, June 26th, followed by four weeks of the unaired episodes. Rather than also air the last five unaired episodes, ABC opted to debut a new game show called Almost Anything Goes on Thursday, July 31st. Episodes of the series dealt with all manner of big and small problems faced by the Wheelers, typically made worse by Zack’s misguided attempts to offer advice or help. In one episode, Doobie had been advised to watch an X-rated movie to prepare for asking out a pretty girl but didn’t like what he saw. When he went to Truckie for help, Zack overheard the conversation and butted in. In another, Zack attempted to raise a little money by selling junk from the barn, only to discover that he had sold Boo’s beloved music box. Other episodes focused more on Truckie: in one, he fell in love with a traveling bookmobile librarian; in another, he went on strike to protest having to support the entire family. John Prine’s song “Illegal Smile” served as the theme song to The Texas Wheelers. 1 A list of pilots in development for the 1974-1975, published in the March 4th, 1974 issue of Broadcasting, listed “The Hogg Family” as one of MTM’s three pilots (“Scorecard on program development for the 1974-75 season,” Page 20). 2 “Housecleaning in prime time as networks issue line-ups.” Broadcasting. 29 Apr. 1974: 17. 3 “Ex-Villain Likes New Acting Role.” Hartford Courant. Associated Press. 9 Aug. 1974: 25. 4 Brown, Les. “Networks Shift Fall Plans to Comply with Court.” New York Times. 28 Jun. 1974: 67. 5 Sharbutt, Jay. “‘Texas Wheelers’ funny show.” Park City Daily News [Bowling Green, KY]. Associated Press. 13 Sep. 1974: 6. 6 Fanning, Win. “‘Texas Wheelers’ Real Prize Tonight.” Pittsburgh Post-Gazette. 13 Sep. 1974: 29. 7 O’Connor, John J. “TV: ‘Planet of the Apes,’ ‘Kodiak’ and ‘Chico and the Man’ Bow.” New York Times. 13 Sep. 1974: 73. 8 “Critical comment, cont.” Broadcasting. 23 Sep. 1974: 26. 10 Mosby, Wade H. “Networks Winding Up Premiere Week Ballyhoo.” Milwaukee Journal. Accent on the Weekend. 13 Sep. 1974: 11. 11 Smith, Cecil. “Kojak a Casualty in Rating Wars.” Los Angeles Times. 19 Sep. 1974: H19. 12 “Rhoda Debut Tops National Nielsens.” Los Angeles Times. 19 Sep. 1974: H22. 13 “Trouble enough to go around as networks assess results of first two rating weeks.” Broadcasting. 30 Sep. 1974: 19. 14 “In Brief.” Broadcasting. 7 Oct. 1974: 6. 15 “Four new series fall with leaves.” Broadcasting. 14 Oct. 1974: 33. 1 From TV Guide, September 7th, 1974, Page 62. Gary Busey just won “CELEBRITY BIG BROTHER.” His look nowadays makes Jack Elam look down-right normal by comparison! I remember this series, I thought it was good and was disappointed when it was canceled and I remember when ABC reran it during the summer I was also disappointed when they only showed it for a few weeks. I remember reading somewhere at the time that they were going to renew it though if it did good during the summer. Do you have any credit sequences with either of these variants? James, unfortunately I only have one episode in my collection, so I can’t confirm whether these variants exist. Thanks for the closing credits, and confirmation of the first MTM variant from the show. Now, did the following exist? – “Traditional” MTM logo, with cartoon Mimsie shooting off guns from her circle. – Series finale variant where the tables are turned on Mimsie and she is shot dead. If so, can you post them if you have them? Do you know where I can buy The Texas Wheelers? This is so cool! I am so happy to finally see at least something from this show on the internet! If anyone should have any clips from Texas Wheelers (or other old Shows of and with Mark Hamill), please share them on youtube or on https://www.facebook.com/itsmarkhamill – you would make so many fans happy! Just as happy as I am now to see this… Thanks!! !